A radio controlled model aircraft, acting as a miniature mothership, carries aloft a model of the X-33. Dryden engineer R. Dale Reed began using model drop tests in the early 1960s to test different lifting body shapes. This included the first tests of the M2-F1, and later the M2-F2, Hyper III, and X-38 designs. The X-33 model is mounted under the Mothership's right boom. 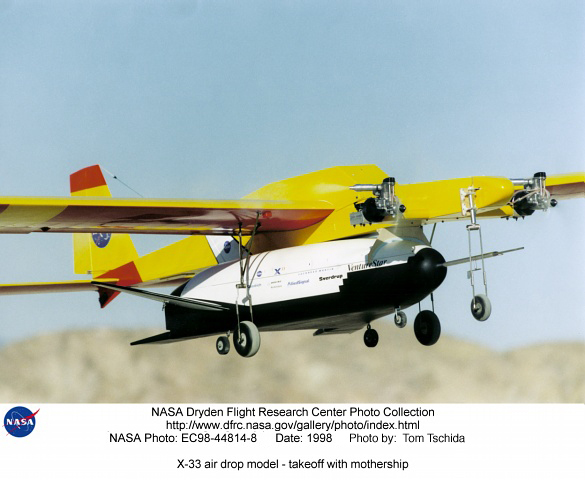 After reaching the desired altitude, the X-33 model was released and glided back to a landing.